The 160m skimmer is an original SoftRock 40(donated by N4GU) that was retrofit with a crystal and band pass filter designed for 160m. Part values for 160m were substituted based on value specifications in the SoftRock Lite II schematics. The 7.3xxMc crystal resulted in the SoftRock center frequency at 1842950Mc. The antenna is the NE facing K9AY, fed into a W7IUV preamp and a cascaded magic-T splitter. The 80m skimmer is a Softrock lite II. The crystal used is 14.138Mhz, resulting in the softrock center frequency at 3.533950Mhz. The antenna is a NE facing K9AY with the feed split three ways following the W7IUV preamp in the shack. The splitter is two magic T splitters cascaded. The 80m Softrock is on one of the two -6db ports of the splitter. CW skimmer currently running on Dell Optiplex 745SFF, with 80m skimmer on the onboard Realtek sound card. Normal operation is at 48khz scan rate, making the scanned range from 3.510.x through 3.557xxMhz. The 40m skimmer is a Softrock v6.2. This Softrock was re-worked from a 9Mhz IF build. It uses a crystal at 28.224Mhz, putting the Softrock center frequency at 7.055015Mhz. The antenna is a NE facing K9AY with the feed split three ways following the W7IUV preamp in the shack. The splitter is two magic T splitters cascaded. The 40m Softrock is on the 3db port not feeding the second cascaded splitter. CW skimmer currently running on Dell Optiplex 745SFF, with 40m skimmer on the Asus Xonar DG sound card. Normal operation is at 96khz scan rate, making the scanned range from 7.007 through 7.105Mhz. The 20m SoftRock is/will be the new SoftRock 20R with all surface mount components. Its crystal oscillator is at 18.73xx Mc. The divide by four gives 4.68xx Mc. In a twist on the plot, for 20m the QSD mixer really uses the third harmonic. So its (18.73xx/4)*3=14.0475xxMc(Actual center=14.04473xMc). As the documentation says, the bandpass filter and software is all that really limits the decoding to 20m. The 20m RX antenna is[will be] a sloping coaxial dipole. [NOT a “bazooka”! see: PA0NHC]. This design scales up easily for HF antennas using different materials. The W4KAZ 20m RX version of the coaxial dipole will be constructed from a scrap of coax and wire. It is fed like an end-fed antenna and with a good choke at the feedpoint works FB, having a feedpoint impedance close to 50 ohms, ie, same as a “normal” center-fed dipole. This is one of those antenna ideas I have tested(years ago), and always been wanting to find a good application to put into use. It should be FB for an RX only application where the choke components need only handle RX levels – implying inexpensive, small cores and small gauge wire will be suitable. 20m will normally run on a Dell Optiplex 360(Pentium dual core e2200 running WinXP) on an ASUS Xonar DS soundcard at 96Kc. The Xonar DS allows 192Kc scan rates, so during certain contests 20m will probably be opened up to 192Kc. The normal bandwidth should be 13.99Mc thru 14.95Mc. At the 192Kc scan rate the bandwidth will be 13.951Mc thru 14.143Mc. That will be useful for the DX contests where activity spills over above 14.100Mc. The sequence of components will be:> Antenna limiter–>20m band pass filter(W3LPL)—>W7IUV pre-amp—->SoftRock. Because of the harmonic problems on the 40m and 80m SoftRocks, these will also be retrofit with the W3LPL design filters. The W3LPL filter design values(links follow) were plugged into the AADE Filter Design program and tweaked to accommodate using capacitor values already available in the parts bin. Tweaking was done using AADE filter design and analysis tool. A very useful bit of freeware, so a great big thank-you-very-much to Neil at AADE. This filter was less difficult to tune than the 10m version constructed previously. Odds are I will re-visit that filter and check values used via the AADE package. Perhaps new component values can be chosen that will make tuning less critical without sacrificing performance too drastically. This plan is pending completion of the 10m experiment. Original W3LPL rx filter design. Decided to experiment with a 10m version based on the principles used in the 20m version. When building the 20m version, the levels on the 6th harmonic were tested. The 6th harmonics seemed to be as strong as the third harmonics. So it will be a fun experiment. 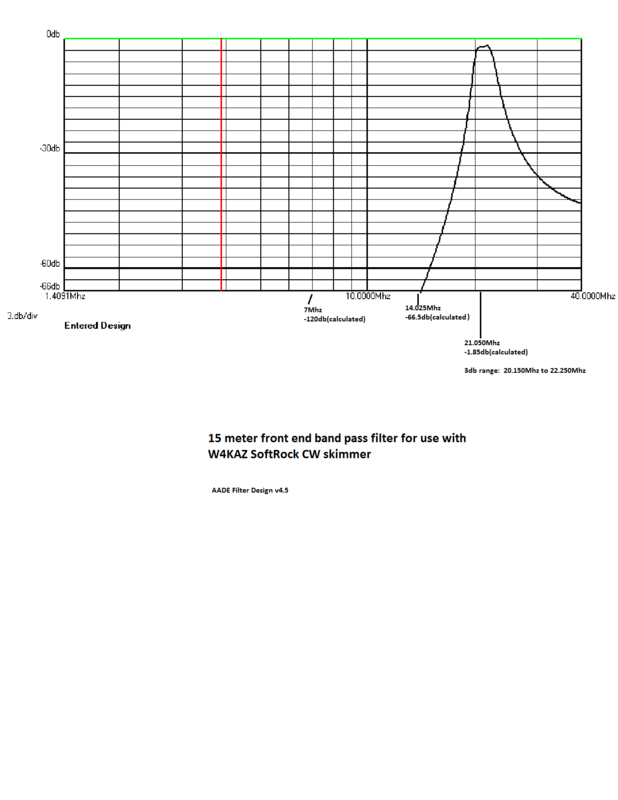 The SoftRock band pass filter will be replaced with the 10m version of the W3LPL RX bandpass filters. 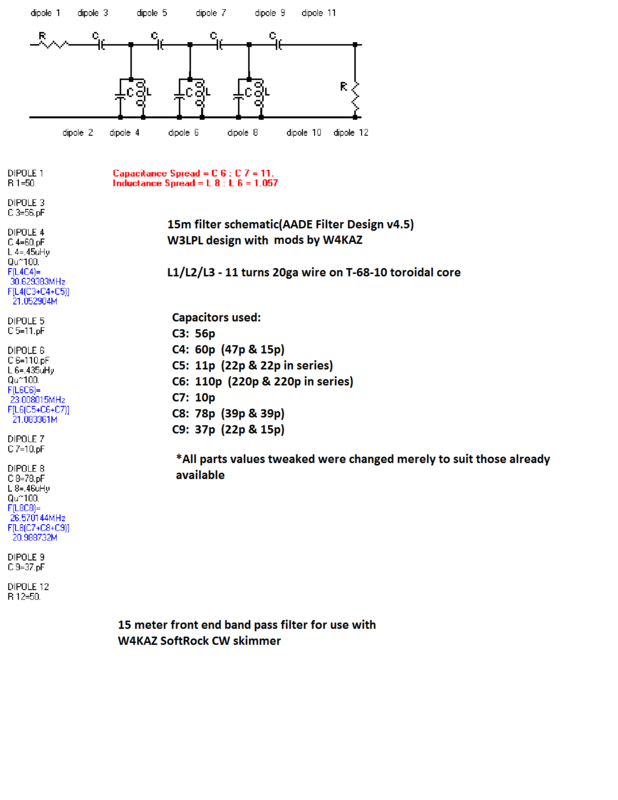 These have been effective on 160m and 80m, and the 10m version filter for this project has been constructed and tuned. The W3LPL filters should do a good job of rejecting the lower band sub harmonics. The filter will be placed in front of a W7IUV pre-amp, which will feed the 10m SoftRock. The 6th harmonic(on the 20m SoftRock) turned out to be around 28.0875, which would work FB with one of the sound cards capable of 192khz scan rates. Unfortunately, the even harmonics don’t work…probably because the quadrature signals from the divider cancel out on even harmonics. Should have thought of that before, but not a waste – the kit can be re-worked for either 10m or 15m, or kept as a working 20m spare. “Plan B” will require finding a different method, or maybe a dead-bug version of the SoftRock V7.0. Plan B: In TESTING, 10/2012>>>>>Ordered/received an inexpensive programmable oscillator from auction vendor, programmed by request for 37.450Mc. The existent 20m softrock was hacked to remove the oscillator stage(removed Q2, C4, C5) on the board, inserting the output of the oscillator at 37.450Mc at the R4-C6 junction. Using the third harmonic from the divider(37.450/4*3) gives a softrock center at 28.087xxxMc. This hack worked FB once the proper supply voltage was provided to the oscillator, which required adding a voltage divider to supply 3.3v. The W3LPL style bandpass filter is used on the front end. Sensitivity on this receiver is down from the lower band versions. Some more de-bugging on the band pass filter may help with sensitivity, possible the filter needs tuning. Given the high(28.087) center frequency, this skimmer will normally be run only when a system/sound card capable of 192khz scan rates is available. The computer/soundcard/band assignments will all likely change after the first few months of actual use during contest season. I expect to run one computer and two bands 24/7/365, and fire up the other computers/available bands over contest weekends and other [seemingly] random times.